In case you have been hiding under a rock and aren't aware of the online extravaganza Etsy, here is your chance to get acquainted. Crafters and artisans alike set-up independent mini boutiques on Etsy. And we are not just talking about your Aunt Jean's sweaters. 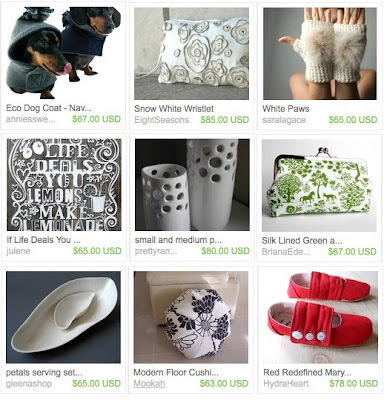 There are tons of cool finds for fashion, housewares, jewelry and more. And the deals can't be beat.Check out Etsy's curated Holiday Gift Guides.